You’ve heard about GDPR, a privacy law adopted by the European Union that went into effect on May 25th. If you’re not familiar, you can read all about it here. 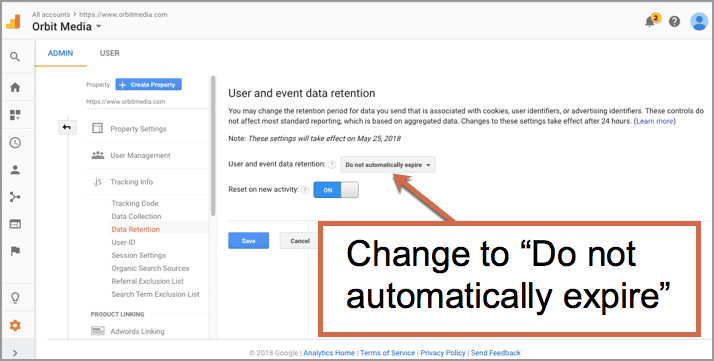 There’s a new default setting in your Google Analytics that you should update referred to as “Data Retention controls.” If you didn’t change it before May 25, 2018, you will lose some of your Analytics data. Disclaimer: The following information is not legal advice nor should it be considered legal advice. 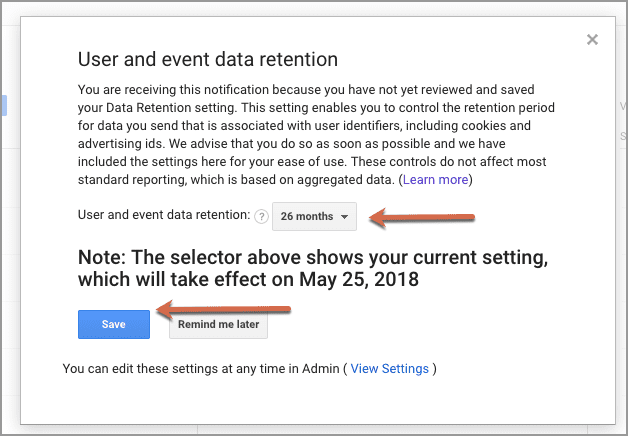 This information is meant to help you better understand GDPR and data retention controls within Google Analytics. 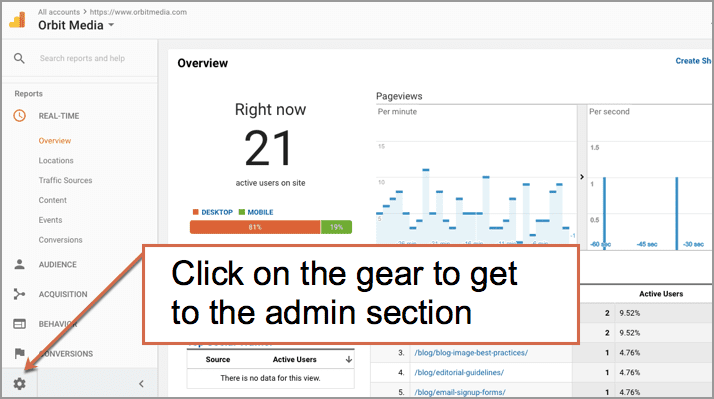 What are data retention controls in Google Analytics? 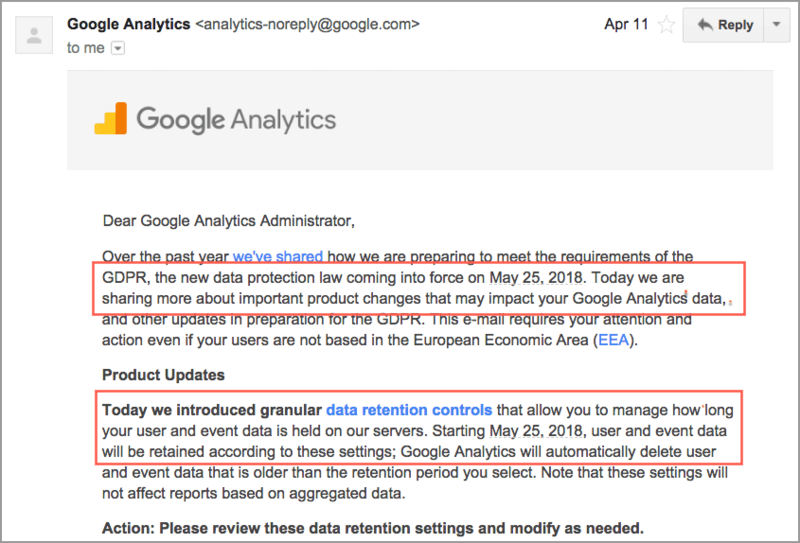 Around April 11, 2018, Google started sending email notifications to admins about their ability to retain data. The language was vague and implied that you would lose almost no data. Unless you spend a lot of time in GA, this information is basically useless. More recently, they updated this language and created a default setting. It’s now set at 26 months. This means that some of your historical data prior to March of 2016 will not be retained (and will be deleted) from Google Analytics starting May 25, 2018. What data is affected by the data retention controls in Google Analytics? If you’ve never heard of any of these features in Analytics, you might not miss a thing. But the data can’t be recovered so it’s a good idea to retain it anyway. Your marketing team (or web development company!) may want the option to do this kind of analysis down the road. 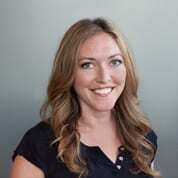 What will not be affected in my Google Analytics reports? Standard reporting will not be affected in Google Analytics. This means your very basic default reports will still be there. Overview, Acquisition, Behavior and Conversions. Great for reporting, not analysis. Even if you missed the deadline, you can still change it change. You will still be missing your non-aggregate data prior to March of 2016 but it won’t reset every 26 months if you change it now. It’s easy. Before you start, log in to Google Analytics. It’s literally five clicks once you’re logged in. That’s really all there is to it. You’re all good now. Thanks for the info, Amanda. Very clear and easy to follow. Thank you for that Amanda – I am awarding you 1500 points for your effort. The frustrating thing is compliance- if we retain this data are we in violation of GDPR? Thanks for such useful information Amanda. I’ve notified my clients about the exact same thing this morning. Could be a sad story to lose all that data just because Google hasn’t been clear in their comms. Thanks for putting this guide together. You bet. I found that default setting by chance. I never saw any communication from them that it changed (not sure if I missed it or what?). 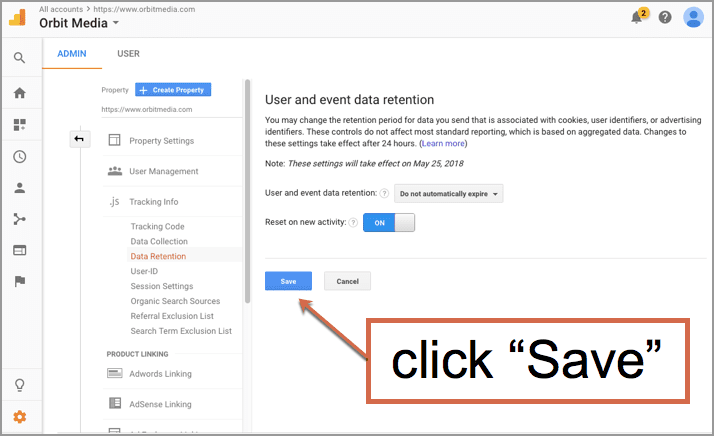 Awesome article on data retention control in google analytics. It’s very useful guide for how to enable and configure. thanks a lot for sharing this useful information.